Janine: I am in two minds about this post. My heart is telling me one answer whilst my head (and DH) tells me something else. As most of you know, we have yet to take our DD11mths (UK Tink) to WDW yet. If I had my own way (and an endless amount of cash) we would have travelled to The World with her this summer when she was 6 months. We did travel to France (you can check out my earlier blog detailing this first holiday) which was hard enough but despite the issues with travelling just to the neighbouring country, I would have loved in my heart to take her to the US. She already recognised and loved Mickey at this age. However, I know in my heart that the 9 hour flight, 5 hour time difference along with the heat and humidity would not have suited her at all. We were still at the stage of nursing every couple of hours and napping during most sessions. Plus she was not a baby who would nap in the stroller or in the car that often so I realise I would have spent an awful lot of an expensive vacation in the hotel room. That being said, if we actually lived in the US and there was not such an issue with time and weather, then I would say that 6 months 'could' be an ok, but it hugely depends on your own child. At 11 months, I would still not be sure about taking Tink as she still nurses and still needs both a morning and afternoon nap. She also doesn't sleep well at night and is even more unsettled somewhere new. Just visiting family one weekend ended up with her waking ELEVEN times during the night. You do NOT want to pay for an expensive holiday only to feel like rubbish and be unable to make rope drop or stay out late as you're too tired from lack of sleep. Amy et al covered many different options in their team post and I would really just reiterate what has already been said. If you own DVC and go to WDW every year, then bringing along a small person of almost any age is unlikely to be an issue. There are many articles on this site relating to tips travelling with babies and essentials such as the baby care centres in the Parks. However, I am more of the opinion (going with my head rather than my heart) that as our next trip is likely to be the only one for a few years now that I have become a SAHM, then we have decided to wait until she is 4. We understand it will be more expensive to wait a little longer as we will miss out on certain things - not paying for a seat on the airplane if they're small enough to sit on your lap and under three's getting in free to WDW and at things like the buffets. But here is our reason why. We think that this will be a nice age where she is young enough to really appreciate and be totally absorbed in the magic, but old enough to know what is going on. Yes, the flight will still be very long for a tot and she'll still need naps and a special schedule to take on board travelling with both a toddler and grandparents, but we will be well practiced by then and know our child's likes/dislikes and tired/hungry/fed up signals etc. She will also be old enough to do a lot of the rides and attractions and interact fully with the characters. 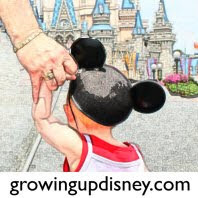 All in all, although we can all give our opinions and advice, I truly believe that you only know if your child is ready for WDW by how your child acts. Someone's one year old may be ready along time before someone else's five year old is. And most importantly, 2014 will be the epic meeting of the Tinks as we plan to meet up with Amy and her family, yay! Corby: Deciding on when the ideal age is to take a child to Disney is sort of a tricky one for me. Disney has something for everyone no matter what age you are which is one of the reasons I love it so much. I do seem to always go back to the first time we took our son. He had recently turned 3 years old and that to me was our favorite trip out of them all so far (they’ve all been wonderful, by the way). Seeing the magic and wonder through a 3 year old's eyes was an experience in itself and one that I will always treasure. Because of this, I would say the perfect age for a child’s first visit would be somewhere around 3-6 years of age. With Fantasyland, all of the characters, playgrounds, fireworks, and parades (just to name a few), it’s a preschooler’s paradise. Having said that, there are some things that a preschooler will not be able to do and if naps are still involved, breaks may be required. The older kids, ages 7 and up will probably love riding the more “thrilling” rides and although they may not admit it, some of the “tamer” ones as well. Some of the attractions that have restrictions or may be a bit frightening to young children won’t be an issue as they are older which is nice. With older children, you also don’t have to worry about going back to the hotel for break time since they can go from morning until fireworks. For children under 3, we brought our 6 month old recently and even she enjoyed looking around at everything. There are all kinds of sights and sounds that can be intriguing even to an infant. So, while I wouldn’t recommend bringing your first child as an infant, if they happen to have an older sibling, I certainly wouldn’t let it stop me. No matter when you decide to take your child, I can assure you, they will have a magical time. After all, it is considered to be the “Happiest Place on Earth“! Beth: Even before becoming a mom, I always looked forward to the day I could bring my children to Walt Disney World. I believe that you can bring a child to Walt Disney World at any age. The question I heard a lot when planning each of my children’s first trips was: they aren’t even going to remember it, why not wait until they are older? The reality is they aren’t going to remember their first trip, but I am. I’ll always remember Joey beaming ear to ear when he first spotted Buzz Lightyear. I can say that at 14 months, he would have been perfectly content spending our entire day in Disney’s MGM Studios (that’s what it was called at the time) at Al’s Toy Barn, the meet and greet area for the Toy Story characters. I remember Hayley’s face when she was just two as she first spotted Mickey and Minnie at Chef Mickey’s on the first night of her first trip. She hugged and kissed them as many times as she could each time they came to our table. I remember Emily at just 10 months dancing in her stroller while in Adventureland, dancing in her high chair as the other children paraded around Crystal Palace and dancing yet again at Hoop Dee Doo to the point that one of the performers came to our table to tell us what a good dancer she was. So even though my children may not remember these moments, it doesn’t mean they didn’t learn from them or enjoy them. If I had to pick a perfect age, I would say it is when you, the parent, are ready to experience your most magical vacation. For us, we made the decision to not visit when the kids were newborns. Emily was 10 months on her first trip and she may not have ridden the rides or been able to walk around the park, but we know she loved it because there were a lot of smiles, laughing and dancing. Of course, I know that we will visit the parks every other year, as long as we can afford it, so I know we will be back. If you are planning your one and only trip to WDW, I would recommend waiting until your child is five or older, so they will have the opportunity to really experience and remember their time in WDW. But I will warn you, on my first trip to WDW my parents said that it would be our one and only trip. Let’s just say, it was such an amazing family vacation they took my brother and I back every other year. Now, 25 years later, we all still visit together, though now instead of four of us there are eleven! So, you may say it is a once in a lifetime trip, but after experiencing Walt Disney World with your children, you just might not be able to stay away! Amy: This is a question where the right answer varies for each family. • For families such as ours who are regular guests at Walt Disney World, as long as you are willing to slow down your trip and do the extra work required, you could take a child as early as your next normal vacation time. Personally, I don’t think I’d take a child under 6 months, but I’m in the camp that doesn’t like strangers near my infant. Tink’s first trip was for her first birthday but I think her little sibling on the way won’t make it until later. My children will be around two years apart and two small ones might be a bit much, even with wonderful grandparents and uncle to help. Right now, I don’t know when my husband and I will be ready to brave the World with two little ones. We are moving much closer to the World, but we'll need to meet the new princess and see when she's up to the trip. • For families that visit once every two or three years, I’d suggest waiting until your child is two or three years old. By that age, everything (feeding, potty breaks, etc.) is a little easier. Airlines do require you to buy a seat beginning at age two but Disney considers under threes as free for park tickets and buffet meals. By this age, children have a few favorite characters and are better able to interact with attractions and shows. • For those families planning the once in a lifetime or once in a decade trip, I’d wait until your child is at least five years old. Not “so they’ll remember it” as many say because we do things for our children every day that they won’t remember. My reasoning is an extension of the ease factor from above. If this is a rare vacation for you, you’re more likely to want to see and do everything. While that’s even tough for adults, an older child will have more stamina to walk around the park and hopefully a little more patience for waiting in lines. • And within each of the categories above, you’d just have to judge if your child is ready for the crowds, lots of stimulation, and long days. More outgoing kids might enjoy a Disney vacation at an earlier age than those with a more reserved personality. Tink loves being the welcoming committee and greeting those who have visited her parks.